I’ve been excited to write this post for weeks ever since Marie Kondo’s new series on Netflix, called Tidying Up, debuted on January 1st. I binge watched it over two days and it totally changed my opinion of Marie’s techniques. In a good way! And that’s what I want to talk to you about today. Now for those that may not have heard of Marie Kondo, let me catch you up. 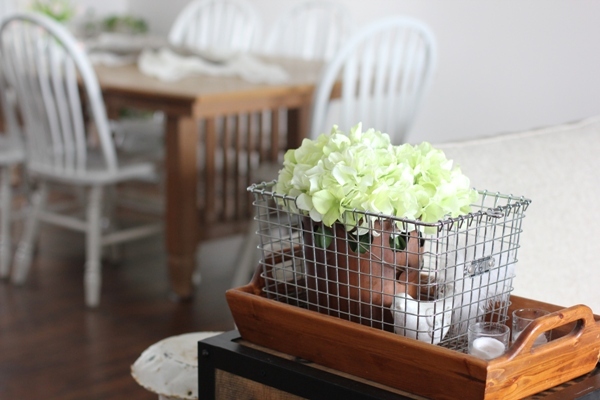 Marie is a very sweet and spunky Professional Organizer from Japan. A few years ago Marie’s first book, The Life Changing Magic of Tidying Up (link below), was extremely popular. So much so in fact that I bought the book and then couldn’t bring myself to read it. I heard what everyone was saying about it and thought it sounded weird. Only keep the things that spark you joy, take the time to fold your clothes in teeny tiny packets, thank your things before discarding them, oy. I didn’t get the fuss so I quietly let the hype pass me on by. That is until Marie’s show came on Netflix. 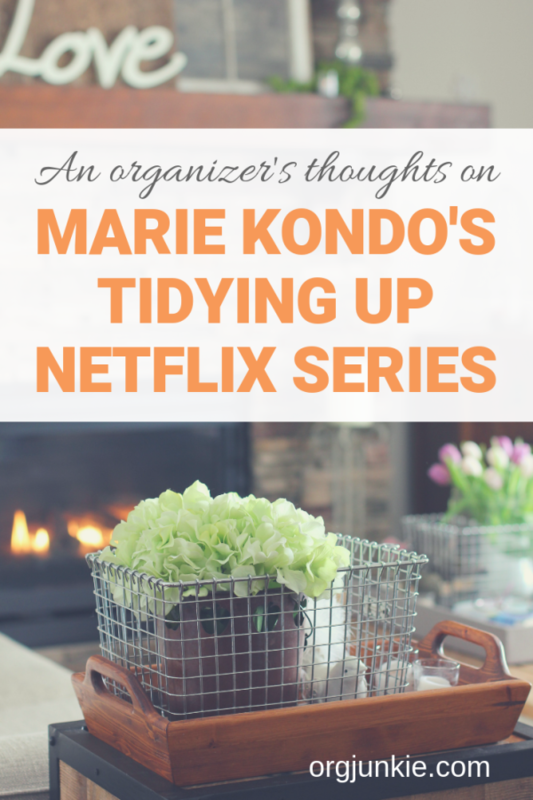 I still didn’t totally get it after watching the first episode but I pressed on and after all 8 episodes I was a KonMari (that’s what Marie calls her tidying techniques) convert. Seriously I’m not kidding. If you are on the fence too, watch all the episodes because each one teaches something new I found. What really brought it home for me was using the techniques with my daughter (who had over the Christmas break moved ALL her stuff home while she goes and studies abroad for the next six months). She had SO much stuff (mostly books, notebooks and art supplies dating all the way back to when she was a kid!) and I have next to no storage space for it in my house. Since my daughter didn’t want to pay for a storage unit, the only logical solution was paring it all down. However my daughter finds it really hard to let things go. In fact I would say every single book and notebook she owned made her so happy in some way. Saying to my daughter that she should only keep the ones she uses and loves was not going to work. Because she used and loved them all. How was switching the wording around to only keeping the ones that sparked joy going to help? Yep can you tell I was still a wee bit skeptical? Here’s the thing. Not only did it work, it worked amazingly well. Yes Marie Kondo tells us that we should only keep the things that spark joy. However, what the series taught me was what that actually meant. It’s not just a simple smile that comes over your face. It’s actually a deep feeling of happiness that lights you up inside when you touch something you own. It affects your whole body. One of the best ways to determine this is by finding a piece of clothing that you absolutely love and would never ever part with. Hold it in your hands and really feel how it makes you feel. That’s the feeling you are looking for. Once my daughter figured this out (it gets easier as you go along) then making decisions was so much easier for her. Yes she loved all her books and notebooks but that actually didn’t mean they all gave her the same “spark joy” feeling. There is in fact a definite distinction once you know what you are looking for. Take the time to figure this out and you’ll be amazed! As well, this technique requires you to focus on the things you want to keep rather than the things you need to get rid of. It’s a mindset switch that was fascinating to watch on the show and with my daughter. She was able to part with so many things in the end, which quite honestly, I didn’t think she’d be able to do. Everything she kept now fits nicely underneath our one guest room bed. So incredible! And if you are still having trouble, Marie will ask the homeowners if they want to bring the item with them into their future. That’s very powerful. Especially if you’ve taken the time to consider, before even starting the tidying process, how you want that future to look. Now I want to address the idea that this technique wouldn’t work for everything in your home. I totally agree that my can opener (for instance) in no way sparks any kind of joy for me whatsoever. Yet I can’t be tossing it away. Some things are just functional, I totally get it. However if you had three or four can openers lying around then I can almost guarantee that they won’t all be sparking the same joy for you. Possibly some of them annoy you which may be why you have so many in the first place. In these cases you’d want to pay attention to the one that annoys you the least to help you make your decision. Now this next technique of Marie’s I was already on board with. It’s why REMOVE is the 2nd step in my own organizing PROCESS. Yep, you are to remove everything of a similar thing (whether that’s clothes, books, papers, etc) from all over the house and pile it all up in ONE location. I know from experience that people really do not like this step. I’ve gotten a lot of push back about it over the years. However it’s just so effective! Yet in order to properly assess and organize your items, it’s important to see everything you own in the same category in one spot. So if you have clothing stashed all over the house, then yes you bring it all together and pile it up. Gasp! That sounds like a lot of work. That’s because it is so much work! But believe me, it is so worth it. On the show every homeowner was blown away by how much clothing they owned when they saw the ginormous pile in front of them. It’s very eye opening. Combine this with the spark joy technique above and you’ve got yourself a recipe for tidying success! If you have yet to try this step, you really must. It’s life-changing! Now one of the techniques Marie stresses as essential is a particular folding technique. 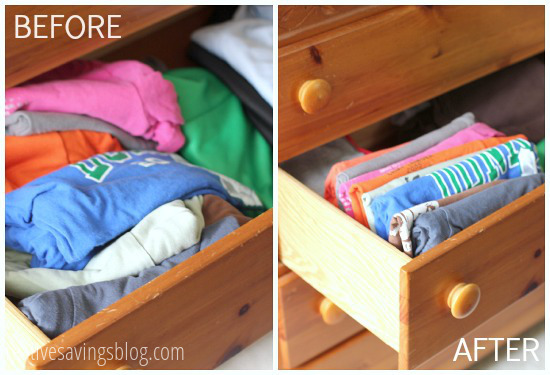 The reason for this though is so you can “stand” your clothing in a drawer. Here’s what she says about it as quoted from her book. “To store clothes standing, they must be made compact which means more folds. Some people believe that more folds means more wrinkles, but this is not the case. It is not the number of folds but rather the amount of pressure applied that causes wrinkling”. She goes on to say that “the number of folds should be adjusted so that the folded clothing when standing on edge fits the height of the drawer”. I don’t store a lot of things in drawers outside of pyjamas, socks and underwear (but I’m totally re-thinking that!) but I have used this technique in baskets before. Remember my leggings basket? It really makes a difference being able to see what you have so you can easily grab the pair you want. Two of my guest contributors have both written about using this technique with great success. Kalyn wrote about her t-shirt drawer back in 2014. 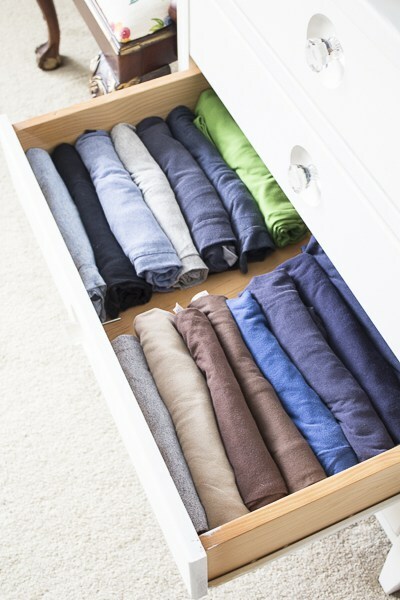 And Yuni later wrote about how rolling her clothes in drawers made a big difference. On the show Marie even had the kids folding this way. I haven’t tried getting my own son (13) on board yet but I may give it a try and report back :). Like with any method I think we need to decide which steps work for us and which don’t. I don’t really see a need to thank my items when I toss them in the donate bin but after watching the show I do understand why it might be an important task for some. Marie explained that thanking your items for how they once served you helps to alleviate any guilt you may carry. While purging guilt isn’t something I deal with, I can appreciate that many people do experience this heavy burden. Overall I really did find the show to be quite delightful. Marie is uplifting and not at all judgemental. Homeowners were encouraged to keep the items that sparked joy and not given a set number of items to achieve. Each homeowner had to decide that for themselves. In fact in the second episode, the homeowner had a HUGE collection of baseball cards. Once he went through the pile using the KonMari method he’d been taught, he still had quite the collection in the corner of the room. And that was okay. I’m now in the middle of reading Marie’s book and absolutely loving it. Too bad I was so stubborn when it first came out, ha! If you’d like to purchase it as well, you can do so right here –> The Life Changing Magic of Tidying Up by Marie Kondo or her second book Spark Joy (affiliate links). I’ll definitely be talking more about this method in the future. Have you watched the show or read the book? Let me know what you thought of it in the comments. I would love to discuss it with you as I’m totally fired up about it now. Books are the hardest for me as they truly spark joy in me. Some are like old friends I won’t let go of and others are new friends I’m looking to get to know better. What does one do? My daughter had more books than clothes. Once she figured out how “spark joy” truly felt for her, she was able to part with so many. She still kept quite a few but totally okay. Good luck! One thing that helped me is to think about my books as part of the person I am and the person I am headed towards being in the future. Will this book bring me joy moving forward or is it a closed captor in my life. Of course memories are wonderful and spark joy but books should also be read and if you don’t see yourself reading them again then let some of them go. Give them as gifts. There is no better gift then a good book from a good friend. Thanks for sharing that Kristine!! This must be the show my daughter watched and wasn’t sure she liked it. I’ll have to check it out though. A friend posted something about the show on FB! 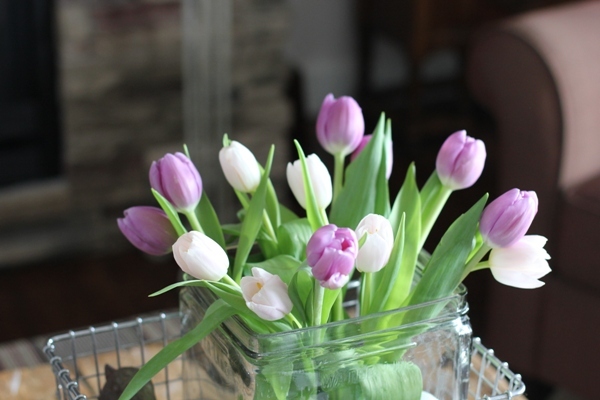 There’s always ways to improve the looks and organization of rooms. Now if I can my daughter doing it will be even better! I hope your daughter has a good 6 months abroad studying. Thanks Becky! Yes definitely check it out, I think you’d really like it. Yes exactly! I am so appreciative of a tool that doesn’t make me frustrated to use, for sure!! I’ve watched several episodes, and agree, the more I watch the more I like the methods. It’s a refreshing change to see that Marie does not insist people eliminate a percentage of their belongings. And I bet most folks get better about purging items (and buying less) as the years go by, once they’ve gone through the process (I know I have!). But I still long for the old show “Neat” with Hellen Buttigieg because she really whipped rooms into shape fast. Seeing those transformations was so satisfying, and inspiring! The NeAT videos are on You Tube! I enjoyed watching that show too!! Thanking items that you give away is a good practice in my opinion. Not so much to alleviate guilt but just to show gratitude for abundance. Being mindful of anything we discard can lead to being more selective of the sometimes excessive “stuff” we buy and bring into our home. Such a great point Donna, I totally agree! I am surprised to find so many people being so judgmental in a bad way about Marie and her tidying methods. It either works for you or it doesn’t. It was not passed as a new law. I watched the show weeks ago, appreciated those things I could apply and let the rest go! Personally, I love her and her philosophy. Thank you for this summary. I’ve watched two plus episodes. Marie is delightful. But I find I don’t like looking at messy homes and people’s things. The recurring pattern I see is too much stuff for the small homes. I’m also seeing that people own too much clothing and shoes. Yes cluttered spaces will often lead to chaotic lives for sure. I think Noah would be over the moon if I applied this to our house! My daughter and I both tidied our clothing yesterday (in two different states). I didn’t want to put things in the pile that I knew I would keep, but it did give me the opportunity to vacuum the cobwebs in the empty closet. 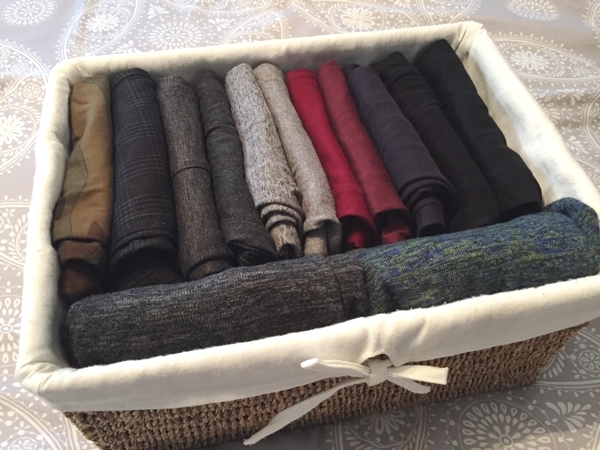 I was surprised that I enjoyed thanking the clothes I was letting go. I’m so proud of how much I accomplished in one day. Yay, way to go Tina!! This was a great summary! My two daughters and I all did our clothes/closets and found things we thought were lost, it was great. A good tip for me, not to judge what my daughters decided to part with, which I think is a tough thing for parents. Young adults are sometimes willing to let go of more than the parents would like due to sentiment. Yes, yes, yes!!!!!! What they deem to be important is so different than what we may think and we need to respect that. Causing them to second guess every decision will only teach them not to let go of anything.